How Do You Solve a Problem Like John Cena? Hulk Hogan headlined his first Wrestlemania in 1985 when he was 32 years old. He went on to perform at the main event level until Wrestlemania 19 in 2003. Maybe the Hulkster is an extreme case, but it’s absolutely conceivable that the former Doctor of Thuganomics could be hustling, proving loyalty, and providing respect for another seventeen years. I’m sure Vince McMahon is cool with this as Cena has proven to be a reliable merchandise mover and squeaky clean front man for the company, but you have to wonder what’s next for him creatively. Clearly his days of chasing the world title should be behind him. Winning the title for Cena now carries the emotional weight of finding a decoder ring in the bottom of your Apple Jacks. In fact, his most recent title win over Alberto Del Rio was so underwhelming that Cena had an embarrassed look on his face. The Internet seems to think turning him into a bloodthirsty heel is the only logical step. I’m not against this idea, but it still seems too soon. In a world of selfish athletes Cena signs tons of autographs, set a record for Make-A-Wish visits, and has never had a drug violation. Yet people still hate him. Here’s how I’d book Wrestlemania, put the Rock over as clean as a sheet on Sunday. Have a win over the Rock become Cena’s white whale. And when Cena finally does achieve his victory, and the fans still don’t give him his due, then you pull the trigger. Turning Cena heel? Yes, it needs to happen. 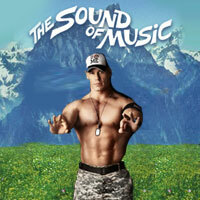 But let’s test the waters of “Cena’s Hunt for Respect” first. I don’t care who wins as long as it’s good. Both of these guys are capable of putting on amazing matches, and they’re sure to be motivated by their third-tier placement on the card. But, if you’re going to put a spinning elbow to my head, I’ll say Jericho wins the match and the title so they can continue the feud. I hate to see Bryan lose the title. He’s doing a fantastic job with it. But, Sheamus is doing a great job on Smackdown, and it’s about time a Royal Rumble winner gets to cash in at Mania. Bah…from a storyline perspective I’m sure we’ll see Team Johnny win. All I care about is Dolph Ziggler looking good. He’s the next big thing, I hope they realize it. Maria isn’t really a celebrity, so she doesn’t really need a Wrestlemania win. Cody’s gotten the best of Show in the build-up and he’s about ready to move past the Intercontinental title. Here’s hoping Big Show keeps the cool classic belt around. Someone will have to tell me how Randy won after I get out of the bathroom. This entry was posted on March 30, 2012 at 4:17 pm and is filed under Wrestling Whatnot. You can follow any responses to this entry through the RSS 2.0 feed. You can leave a response, or trackback from your own site.